My laptop’s screen glowing bright in the well lit dining section. Coffee brewing, the smell is intoxicating–even though I am not a fan of caffeine. People are chattering, mostly their orders to the barista on behind the counter, asking for a plain cup of coffee and a raisin cookie. Or a pumpkin spice latte with soy and less foam, please. And also a blueberry muffin, to go. Being surrounded by books is oddly comforting, I’m realizing lately. People quietly flipping through magazines, rustling through the pages of chapter books to get a sense of their contents, and the silent understanding of remaining quiet. I’m starting to realize this is part of my new normal. Once it was waking up at 6:30am, groggy and dreams just fading from memory. Faint rumbling and buzzing underneath my floorboards as the garage door creaked closed. Outside the window I can see my dad’s taillights disappearing into the early morning fog. A slight chill hung in the air as I stumbled out of bed towards the bathroom in the dim hallway. Light peeked from my parents’ room, signaling my mother was awake and preparing for her drive to the office. Staring at the reflection in the mirror, I assess the damage from the night’s sleep–hair either wrapped up tightly in a silk scarf or not, possibly sticking out in any which direction it chose. Perhaps the occasional bags under my still drooping eyes. My mouth dry, needing attending to. I sigh heavily. In my mind, the possibilities of the day ahead play as if on tape. Teeth? Hair? Shower? Clothes? Picking up my toothbrush, I add some mint flavored paste and begin brushing lackadaisically. The brush’s vibrations loud in my head and spinning furiously. Am I supposed to sing ‘Happy Birthday’ twice when I brush? Or is that for hand washing? I spit out the residue from brushing and begin to slosh the purple-ish liquid around in my mouth–it begins to burn and I don’t make it to the recommended 30-seconds long gargle. I stare my hair down in the mirror. My brow furrows and the will to continue preparing for the day leaves me almost immediately. I go on. Spritzing my hair with water is the simplest part. The follicles are thirsty for moisture. I pick up a brush, deciding against the battle to comb it out and begin brushing up the sides, the back, the front, to get something that looks like a semblance of trying. I grab the black, stretchy band. A full out fro awaits it. 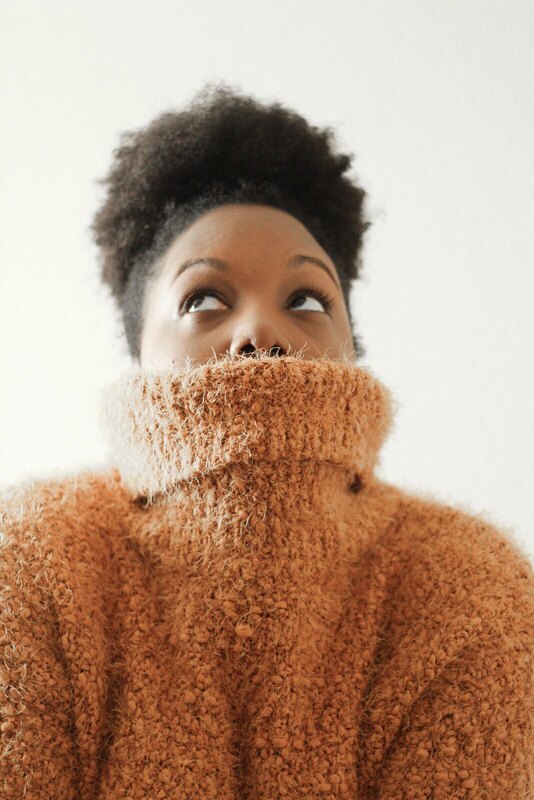 I grab all of the hair I can and gently–or not-so gently–coerce it into a high puff atop my head. Success. A faint “Goodbye, Leigh. Make today a great one, honey!” makes its way through the crack of the almost closed door. I echo the sentiments back to my mom and hear her footsteps make their way to the kitchen, then to the family room, then to the garage. The garage door once again growling as it opens up slowly, painfully. I hear her car start below and the groans of the garage indicate that she is gone. Stepping out into the hallway, I groggily make my way back to the bedroom. Rifling through my chest of drawers, I pick out undergarments–first a bra, then underwear–then I open the mirrored closet doors, it catches on something underneath it. I pick up my fallen scarf and place it back to the top of the shelf. Grabbing a plain, grey t-shirt and blue jeans, I settle on the fact that today, I will probably not catch any handsome man’s attention. I am okay with that, but just for today. Tomorrow, I will actually try. I am already late to leave. Now, I need to hustle. Deciding against makeup today, I wrangle my purse, water bottle, gym bag, book for lunch break and make sure I grab my keys too. Before dashing through the door, I note my unmade bed. Racing down the stairs, lights still blaring in my dad and mother’s wake, I plop my overstuffed bag and water bottle down on the kitchen table–my keys hit the glass and send a spine tingling ding throughout the room. Oops. I swiftly pull open the fridge and begin to rummage through it. Grab a fruit. Grab a frozen meal. Grab a snack. Grab another snack for that pesky 3:30PM lull. I search for my lunch bag–drat! It’s at work, again. I make a mental note not to leave it at work tonight, as I have absentmindedly done for the past 3 days already. I grab for a plastic bag under the kitchen sink and hastily stuff my lunch items into it. Grabbing my makeshift lunch bag, my jacket hanging from the dining room chair, my large bag on the table along with my water bottle I almost missed, I run over to the keypad. Punching in the familiar code, I wait for the Beep. Beep. Beep. Beep. I race out the door, shutting it tightly behind me. My keys jingling as I find the house key to secure it. I bound down the steps towards my car. I toss my belongings into the passenger seat, climb into the driver’s seat and shut the door. Turning on the car, the air conditioning, left on from yesterday’s evening heat, blasts me with too cold air. Too cold for the morning. I promptly turn it off, shivering. Finding my playlist for the hour-long car ride, I hit PLAY. Familiar melodies bouncing throughout the car, I take off the safety brake and slowly put the car in drive. Driving away, I am careful to avoid the ever-present dip in the road, avoiding a scratch on my front bumper. I look back towards the house one last time. The birds have just landed on the front lawn, pecking for worms. The trees standing proudly and firmly on the green lawn behind me. Everything’s different now–I’m still sitting here at Barnes and Noble–thousands of miles away from normalcy. Finding a new normal has been hard. But just as it was before, I will find it again. This is beautifully written. I love the description in the story and how you talked about your morning routine. I hope you find a new normal very soon. Moving away from family and friends and what is familiar can take its toll (I moved to a different city last year and it took me a while to get my footing but now it’s all good even though I miss my sisters and family sometimes). I have learnt to be more independent, make new friends and join a local church community that helps keep me grounded. I wish you all the best in your new home and hope you find your new normal soon ❤. My dear sister! First and foremost I miss you so much and I love you. This post was so real and it really had me drawn into what you are saying. I’m praying for you and I know that the Lord will keep you and will bless you with a “new normal”. I can see that your being away is helping perfect your writing and your blog. Keep it up! Oh we need a Skype or FaceTime date soon. Thank you Tiya, for your encouragement, love and friendship! I miss you so much – yes, I will text you to figure out a good time to Skype! Thanks so much, Amber!! That means a lot to me.